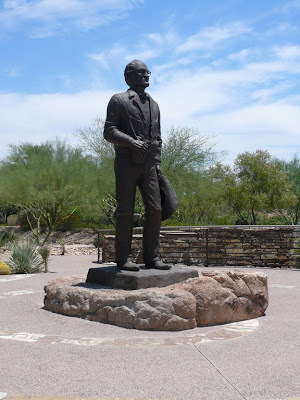 Today I have stepped outside the Phoenix city limits by just a few blocks to feature a special tribute to Barry Goldwater a long time resident of the town of Paradise Valley. Goldwater served in the US Senate for three decades and ran for President of the United States in 1964. This beautifully landscaped memorial was dedicated on February 14, 2004 by Governor Janet Napolitano with the assistance of Justice Sandra Day O’Connor and numerous other elected officials. The ten-foot bronze sculpture is by artist Joe Beeler, a founding member of the Cowboy Artists of America and a personal friend of Goldwater. In addition to his political service, Goldwater was a skilled pilot, a talented photographer and a passionate Arizonan. This memorial sits in a park setting with this statue in the center surrounded by native Arizona plants. It's a quite beautiful setting.